You are here: Home / Rider News 2012 / Fighting Theft! 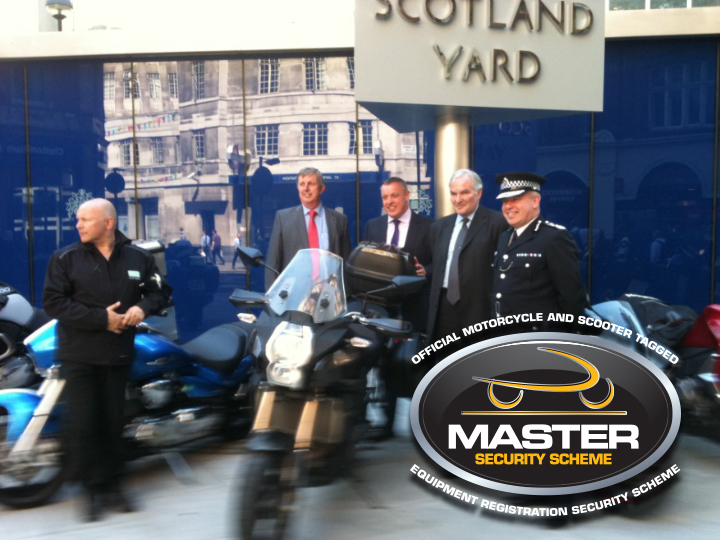 This week the Motorcycle Industry Association (MCI), has launched an official security marking scheme called The MASTER Security Scheme to be utilised by its motorcycle members. According to the MCI and listed on the MASTER Security Scheme website, these include BMW Motorad – Honda – Kawasaki – Suzuki – Triumph – Yahama. Of course it is good that the Metropolitan Police is working to keep London’s bikers riding, but what of bikers in other parts of the UK including here in Northern Ireland? Right To Ride’s Elaine Hardy asked that question to Kevin Howells, Datatag Managing Director. She was assured that the scheme, as it is available on the above mentioned manufacturers bikes, will be available in Northern Ireland and that the PSNI will be informed. Kevin Howells pointed out that the scheme has just been introduced therefore the objective now is to contact the police forces to spread the message about the scheme and get them using the scanners. Recognising the effect that motorcycle crime is having on the motorcycle community, the Motorcycle Industry Association (MCI), has launched an official security marking scheme called The MASTER* Security Scheme to be utilised by its motorcycle members. 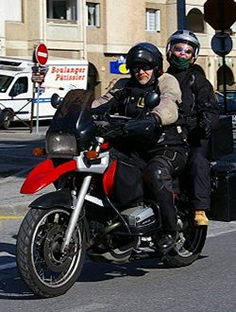 Figures from the MCI show an estimated 43% of all insurance total loss payouts are due to theft and added to this the figures from the Motorcycle Crime Reduction Group suggest that 40% of victims of motorcycle theft leave the motorcycle community. 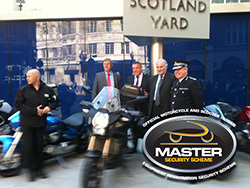 The MASTER Security Scheme, a motorcycle and scooter security marking and secure registration programme, has been developed in conjunction with the police authorities and Datatag, the country’s foremost supplier of security marking technology, who will supply not only the component marking elements of the scheme but also the registration infrastructure and call centre operation. The scheme has the backing of the major manufacturers and the Metropolitan Police in the battle to reduce crime and keep Britain’s bikers riding. Steve Kenward, CEO of the MCI said ‘Theft is and has been a great concern for the industry and we need to do all we can to help combat it. Security marking of bikes has been proven to be effective in both reducing theft and aiding recovery, and we are confident that by launching this scheme we not only promote standardisation across the industry but also start a long term reduction in motorcycle crime as the parc of motorcycles marked by the MASTER Security Scheme grows over the coming years.’ He went on to say ‘As modern machines become more valuable their appeal to criminals increases – we all therefore, need to do more to ensure we don’t fall victim as an industry or individual’. Some 26,000 machines were stolen in the UK in 2009, and due to the methods employed by professional criminals only a small percentage are ever recovered. London, hit hardest by motorcycle crime, sees more than 35 machines taken each day from its streets, with often more stolen than are sold new on a daily basis. The MASTER Security Scheme was launched yesterday at New Scotland Yard with the Deputy Commissioner of the Metropolitan Police, Craig Mackey and Lord Henley, the Crime Prevention Minister. Nearly 26,000 powered two wheelers were stolen in 2009. Motorcycles are nearly 4 times more likely to be stolen than cars. Recovery rates for Supersport bikes in 2008 were only just over 18% (against the average of over 41% for all bikes, or nearly 80% for cars) reflecting the trend towards breaking these types of machines for parts and rebuilds rather than selling them whole. The MASTER Security Scheme system has Home Office and ACPO accreditation under the Secured by Design scheme and complies with several other quality accreditations including ISO and LPS (Loss Protection Standards) for their secure database. When a MASTER Security Scheme marked motorcycle is ultimately sold on the Scheme registration can be transferred to the new owner. (A small admin fee applies to transfer requests). Information is stored on Datatag’s secure database – accessible 24/7 and which is both Home Office and ACPO Police Secure accredited. Datatag offer aftermarket security marking kits for all machines with specific scooter and motorcycle kits available to all second hand machine buyers . The MCI represents 120 members; around 90% of the supply side of the motorcycle industry.